The glamorous and unflinching story of Tony Delvecchio. 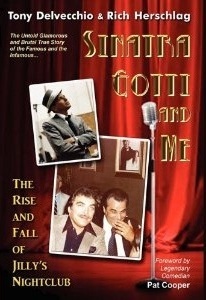 http://www.prlog.org/10602423-archebooks-publishing-lands-the-lost-chapter-of-sinatra-gotti-and-me.html ArcheBooks Publishing Lands the Lost Chapter of Sinatra, Gotti, and Me The late Tony Delvecchio, once owner of NY hot-spot, Jilly’s, in the 1970, reveals candid, first-hand, behind-the-scenes glimpse into the glamorous and dangerous life of celebrity and the mob, through the pen of author Rick Herschlag. Find out what's new in the wiseguy world. Follow us by entering your email below.